Dual Sim Phone are useful if you carry 2 handsets, and recent Dual Sim Phone are coming feature packed and also priced very competitively. AirFone launched AF 11, the cheapest Dual Sim Phone few months back, now they have come out with AQ9 and AQ9+ two Full QWERTY Dual Sim Handsets at very economical price for the Indian Mobile Consumers. Buddy AQ9 features Dual Sim (GSM+GSM) Phone with Dual standby, wireless FM, MP3 player with surround sound, one touch access to MP3 player and FM radio, five LED Torch, expandable memory, 1.8-inch QVGA 256k color screen and Mobee.in to check emails (Gmail, yahoo, lotus notes etc.). Buddy AQ 9 Priced at Rs. 2,099/-. 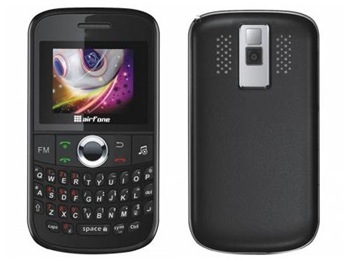 AirFone AQ9+ Dual Sim (GSM+GSM) Phone with Dual standby, wireless FM, MP3 player with surround sound, one touch access to MP3 player and FM radio, five LED Torch, expandable memory, 2.0-inch QVGA 256k color screen and Mobee.in to check emails (Gmail, yahoo, lotus notes etc.). 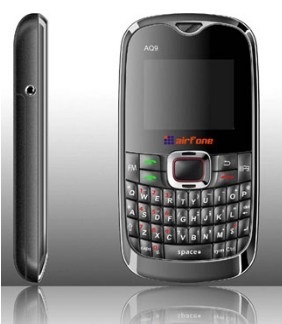 AirFone Buddy AQ 9 plus Price – Rs. 2,500/-. The new Buddy handsets (AQ9 and AQ9+) are available in red and black colors.